Beecher and community was shocked Monday morning, when the news of the sudden death of Mrs. Henry Hack, who had passed away at midnight, was circulated. It was generally known that Mrs. Hack had been ill for the past two years, but even members of her home circle were not aware that the call of the supreme maker was so near. She had been feeling in her usual health all day and even up to the time of retiring for the night. 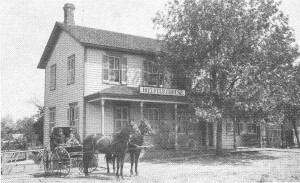 Mrs. Henry Hack, nee Mary Bielfeldt, was born July 20, 1865 at Norderstafel, Schlesswig, Holstein, Germany. When 11 years old she, together with her parents, came to America, making Thornton, Ill., their home. 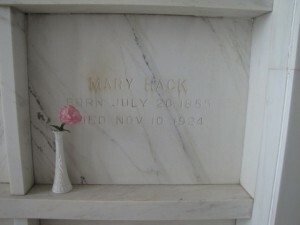 On May 1, 1883, she was married to Henry Hack, Rev. Gustav Koch, then pastor of St. John’s Church, officiating. This happy couple was blessed with two sons, Edmund and Albert. After their marriage, Mr. & Mrs. Hack took charge of the so-called Bielfeldt hotel, which is now known under the name of Hack’s hotel, has a splendid reputation both far and wide, this reputation being mostly due to the motherly, friendly ways of Mrs. Hack, who possessed the rare gift of making everybody feel at home who stepped under her roof. Ill for some years, her condition gradually grew worse. But even then she could not see her way clear of laying down the work which had become a second nature to her. Thus, although still attending church in the morning, and seemingly as well as could be expected, the great call came to her, as she often expressed it would in full pursuance of the work for which she was so well fitted. Fifteen minutes past twelve, on Monday morning she closed her weary eyes, having reached the age of 69 years, 3 months and 20 days. The surviving and deeply mourning relatives are the husband, the two sons, Dr. Edmund Hack of Hammond, Ind., and Albert of Beecher; two sisters, Anna (Mrs. Fred Bielfeldt) of Mount Vernon, S.D., and Minnie (Mrs. Myron Tillotson) of Beecher, two grandchildren, as also a large host of other relatives and friends. 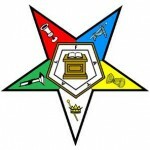 Funeral services were conducted, today at 1:30 o’clock from the house, where Rev. Horst officiated and a quartet composed of Mrs. Reid, Mrs. Prohl, Mrs. Sprot and Mrs. Saclow of Hammond Ind., rendered a song. The services were continued at St. Luke’s Church, which was crowded to overflowing, where Rev. Horst paid due homage to the deceased in the two beautiful sermons in German and English, and where the quartet rendered the deceased’s favorite song and Mrs. Proh; rendered a very touching solo. Mrs. Wells of Hammond presided at the organ for the quartet and the solo, while Mrs. Herman Niedert preformed the usual services as organist. The numerous and tastefully arranged floral pieces in some way paid a silent tribute to the high esteem in which Mrs. Hack has been held by everyone who knew her. 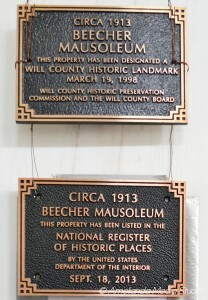 Her remains were laid at rest in the Beecher Mausoleum, where after Rev. Horst had consecrated the body, the Eastern Star of which the departed had been a member, conducted a service according to their ritual. “Mother” Hack as she was familiarly and fittingly called, possessed in a remarkable way the ability of making and holding friends wherever she was. This entry was posted in Automated Burial Listing, Eastern Star, HEADSTONE, Obituaries- Have Full Copy, St. John Evangelical Lutheran Church - Eagle Lake, St. Luke's UCC - Beecher by Sandra. Bookmark the permalink.